Minato City is home to major foreign corporations and embassies so it comes at no surprise that the ward is the hub of Tokyo’s international activities and home to many of its foreign residents. Its neighborhoods in central Tokyo range from quiet, green residential areas to fashionable shopping and nightlife districts. Minato ward (also known as Minato City) is one of the most international areas of Tokyo, and has one of the highest populations of foreign residents at 8%. Within an area of only 20.37 km2, it concentrates the majority of the business and diplomatic activity in Japan. The ward’s main business districts are Toranomon, Shimbashi, and Shiba. The main commercial areas include Aoyama, Akasaka, and Roppongi. With a population of 255,320 and 12,421 inhabitants per square kilometre, the city is one of the less populated wards in Tokyo, however it receives ample foot traffic during the day and on weekends. The average age of a Minato ward inhabitant is 42.6 years of age, making it one of Tokyo’s younger wards. The main residential areas are Azabu and Shirokane. Needless to say, they constitute Tokyo’s most expensive neighbourhoods to live. Throughout Minato City are abundant greenery spaces, including Shiba Park, the Institute of Nature Study in Shirokanedai, Aoyama Cemetery, and the Akasaka Imperial Property. Azabu and Moto-Azabu are some of the most popular areas for expat families as they are close to embassies, company headquarters and international schools alike. The heart of the Azabu area is the Azabu-Juban shopping street that offers a charming mix of traditional, long-established Japanese shops, and international, high-end stores. The area also offers a wide selection of restaurants and bars, both local and international. Moto-Azabu is a quiet, luxurious residential neighbourhood and home to several embassies, with high-end housing in low-rise apartment buildings or detached houses favoured by diplomats and expats. Motoazabu Hill is a high-rise condo that has become the area’s landmark. Roppongi is within walking distance, and from Azabu-Juban Station most parts of Tokyo are easily accessible, including several international schools. A business hub by day and an entertainment district by night, Roppongi is an area of Tokyo that never sleeps. Its two landmarks are the famous Roppongi Hills and Tokyo Midtown complexes, which are some of the largest redevelopment projects in Japan. They provide green spaces, as well as high-end shopping, residential, and office spaces, and serve as the headquarters for many foreign corporations and homes for international residents. The area also offers many restaurants, bars, and nightclubs, and attracts tourists and young people as well as businesspeople after work at night. Close to other bustling commercial and business districts — including Aoyama, Akasaka, Toranomon, and Nishiazabu — Roppongi is a popular residence for expats and mainly offers high-rise condominiums. The area is well connected to other parts of Tokyo by two metro lines and a network of bus routes. Adjacent to the governmental districts of Nagatacho and Kasumigaseki, Akasaka is another hub of embassies, foreign corporations as well as noteworthy and long-established hotels. In recent decades, commercial and business complexes like Ark Hills have sprung up in the area. It also serves as a high-end entertainment district for business patrons at night, with traditional Japanese bars, tiny restaurants and jazz lounges. Akasaka has many quiet pockets, making it a good choice as a residential area that offers both older low-rise and, more recently, high-rise options. Aoyama is one of Tokyo’s trendiest districts. It effortlessly combines quiet residential areas with fashionable streets lined with upscale shops and cafes. Aoyama Street and Kotto Street form the heart of the area. Many expats call Aoyama their home. It is dominated by detached houses and low-rise apartment complexes, while a few high-rise condos have been added in recent years. The neighbourhood is close to the ever-popular Shibuya and Omotesando and Harajuku areas, making it a convenient choice. Kamiyacho is a business area close to Roppongi and Kasumigaseki with many international company headquarters located here. Large commercial complexes such as Toranomon Hills, Izumi Garden, and Atago Green Hills, as well as several European and other embassies can be found in the area. The area around many of the redevelopments was landscaped with ample greenery, making it a pleasant area in which to live and work. Kamiyacho is located at the geographical centre of Tokyo–thus making it one of the most convenient locations to commute from. Shirokane and Takanawa are two neighbouring areas with an abundance of green space right in Central Tokyo. With an upper-class air, they are two of the most affluent areas in Tokyo and are characterised by highly discreet but prestigious restaurants and stores lining its quiet streets. The nearby Institute of Nature Study provides lush greenery and many shrines and temples dot the area. Many expats as well as affluent Japanese live in this area close to Shinagawa and Tamachi stations on the JR Yamanote Line. The new Yamanote Line Station Takanawa Gateway will provide even more convenient connections to the area by 2020. Minato City has the highest concentration of amenities and services for foreigners in all of Tokyo. These include international schools, English-speaking hospitals, and international supermarkets. Also within Minato ward are many large-scale commercial complexes, consisting of malls with hotels, conference centres, and even medical services, such as Roppongi Hills, Tokyo Midtown, Toranomon Hills, Ark Hills, and Shiodome Sio-site. Of interest for businesses is the “Special Zone for Asian Headquarters” initiative by the Tokyo Metropolitan Government. Created to attract foreign companies, corporations that set up their headquarters within the zone receive special benefits and exemptions. Roppongi, Toranomon, Shimbashi, and Tamachi, all located in Minato ward, fall into the zone. Benefits include local tax discounts, deregulation, financial support, and business and life support, to name a few. Tokyo’s most popular international supermarket, National Azabu, is located in Minato, close to Hiroo Station. Motomachi Union Supermarket carries a range of imported products and is located in Roppongi Tokyo Plaza on 1F. Nissin World Delicatessen is a large international supermarket with over 40,000 products from around the world located in Higashi-Azabu. They even operate a butcher counter with imported meats. Kinokuniya International Store is an international grocery store located in Kita Aoyama, just a one-minute walk from Omotesando Station. Seijo Ishii and Kaldi Coffee Farm, two chains of smaller international supermarkets, operate several branches in the district as well. Several large hospitals are located in the ward. The Sanno Medical Center, Aiiku Hospital, Toranomon Hospital, Saiseikai Central Hospital, IUHW Mita Hospital and JCHO Tokyo Takanawa Hospital usually have English-speaking physicians on duty. Minato has one of the best selections of gyms and fitness clubs in Tokyo. The popular international fitness club Gold’s Gym has several branches, in Omotesando, Minami-Aoyama and Hamamatsucho. Club 360 in Azabu is a popular personal training, kickboxing and rehabilitation gym catering to expats with all English-speaking staff. The 24-hour chain Anytime Fitness operates many outlets. Other big Japanese chains like Konami and Tipness are represented in several locations here as well, usually with English-speaking staff. Many of Tokyo’s international schools are located in Minato ward. There are about two dozens international kindergartens and preschools to choose from, including the American School in Japan Early Learning Center. The Tokyo International School, Nishimachi International School, and Montessori School of Tokyo are three co-ed schools from kindergarten through junior high located in Minato City. Minato ward provides luxury housing options with European or American home layouts and amenities. Many areas are dominated by low-rise apartments and detached houses, while more and more redevelopments focus on high-rise condos with upscale facilities and English-language front desk service. On average, it is the most expensive ward of Tokyo to live in. New properties of up to 5 years sell for JPY 1,790,000/m2 on average. For a place of around 10 years old, the average price is JPY 1,540,000/m2, while 20-year-old units go for 1,180,000/m2, and properties that are 30 years or older finally drop below the one-million yen mark to JPY 940,000/m2. 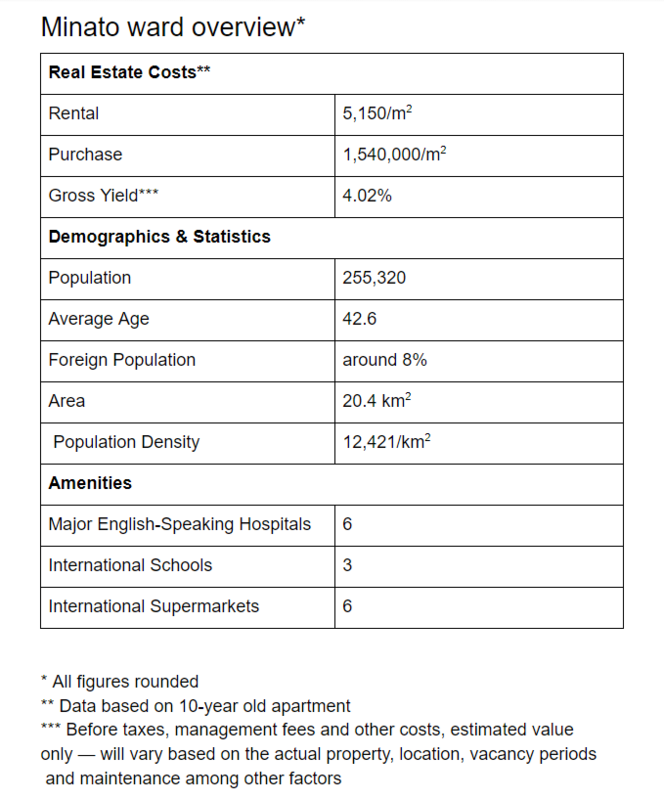 Renting is also an expensive affair in the upscale neighbourhoods of Minato. New units go for JPY 5,550/m2 on average, with 10-year-old properties not far behind at JPY 5,150/m2. Prices drop off for older places to JPY 4,500 /m2 for 20 years and JPY 4,100/m2 for units that are 30 years or older. At such high rates, ROI for residential properties is low despite constant high demand. Gross return on investment for a new property is only around 3.7%, before taxes, inflation or expenses. Yields increase substantially for older places, with a 20-year-old property returning around 4.6% a year and a 30-year old unit even 5.24% on average. However, older properties might bare other risks like vacancies or higher repair and maintenance costs.